Most people who visit Cambodia go to Siem Reap City, the gateway to Angkor Wat. For many, the temples at Angkor are the only thing they see in Siem Reap or even all of Cambodia: get in, get out. When we visited Siem Reap, we decided to make the most of our visit and discover the city beyond Angkor. Here are some ideas for things to do in Siem Reap City besides the temples at Angkor. Food memories linger the longest for us. Cambodia is known for ourstanding cuisine and street food but the options can be overwhelming. We signed on for an evening tour with Siem Reap Food Tours. 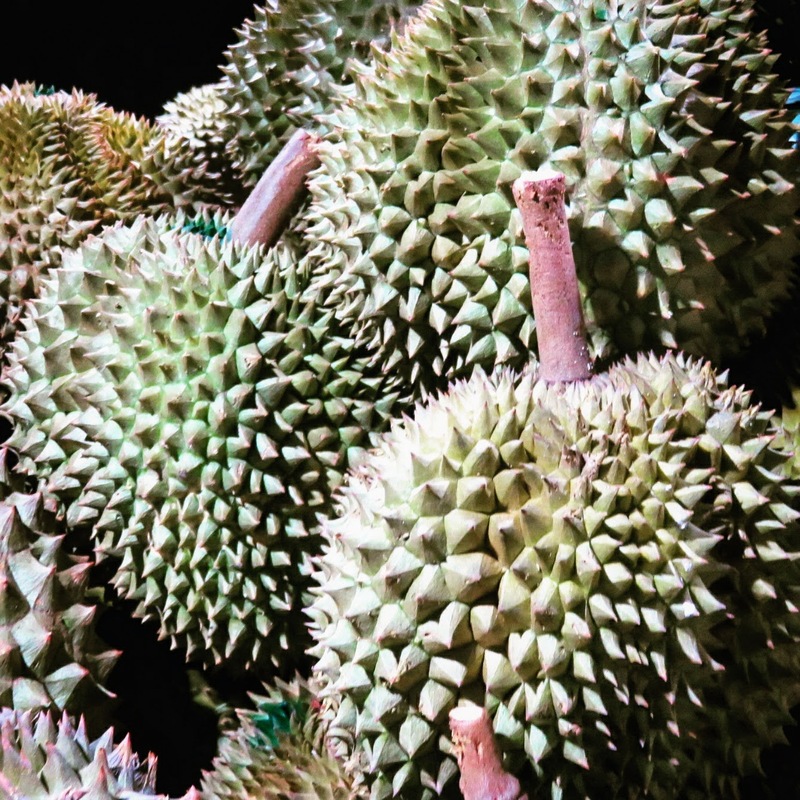 Cambodian barbecue and durian were just two of the highlights of our tuk tuk powered adventure. Siem Reap is known for the bar and party scene on Pub Street. Get a cheap beer (but be warned that the draft beer is likely watered down) or cocktail and enjoy a bit of people watching. Pub Street reminded me a bit of Dublin's Temple Bar; just hotter and more humid. The Royal Gardens in Siem Reap are a green oasis in this bustling city. We looked up and were stunned to see a huge number of bats taking shelter in the trees. Look at that wingspan! You can definitely satisfy your inner shop-a-holic in Siem Reap. We visited the Siem Reap Night Art Market where we got our fill of Cambodian crafts and souvenirs. Be prepared to bargain. We were particularly impressed with the Buddhist temples in Siem Reap. Wat Damnak was one great example. Colorful towers adorned the monastery. We even discovered a storage area for the buddha statues they just didn't have room to display. Walking around Siem Reap with no particular destination in mind, we stumbled upon Wat Preah Prom Rath, a more modern Buddhist temple. The thing that surprised me the most about this temple was the gruesome imagery. We saw a princely figure on a chariot...nothing out of the ordinary... until we took a closer look at what the chariot was approaching. That's when we saw the corpse with ravens pecking away at the intestines. What the...? I'll admit that I wasn't super-hungry after our visit to Wat Preah Prom Rath but that quickly changed when we sat down to eat at Spoons, an EGBOK ("Everything's Gonna Be OK") restaurant. Spoons helps disadvantaged Cambodian youth learn useful skills and enables them to earn a better living. We had one of the best meals of our entire trip at Spoons. Amazing Cambodian dumplings, passionfruit and mint soda, and chicken with a spicy tomato-based sauce definitely satisfied our appetite. We spent an evening in Siem Reap marveling at Sokha a performance by Phare Circus, another organization that teaches useful skills (in this case dance and acrobatics) to disadvantaged youth from parts of rural Cambodia. Sokha was an amazing take on Cambodia's history and included live painting, an acrobatic Pol Pot, and a tremendous sense of heartbreak followed by hope for the future. The performers had fantastic energy. They also showed incredible trust. The way the performers leaped and tumbled without hesitation, relying only on their partner to catch them and prevent them from breaking their neck. Such commitment! For a better sense of the performance, check out my video below. Phare Circus is a "must see" when visiting Siem Reap. We visited Siem Reap in April and, no surprise, it was incredibly hot and humid. One of my favorite things to do in Siem Reap was come back to our hotel, Memoire d'Angkor, in the afternoon for a siesta. It felt so good to just lie on the bed in front of the air-conditioner. Make sure to take time to cool off in Siem Reap. The heat can be debilitating. We even discovered a hipster coffee place in Siem Reap: Little Red Fox Espresso. 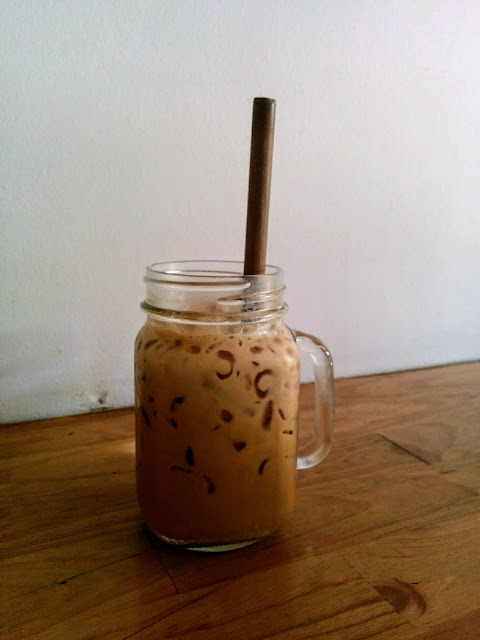 Sample an ice coffee in air-conditioned splendor with free wifi too. We sooned learned that Cambodian sunsets are pretty special. From the balcony in our hotel, we witnessed a huge orange orb dipping below the horizon. 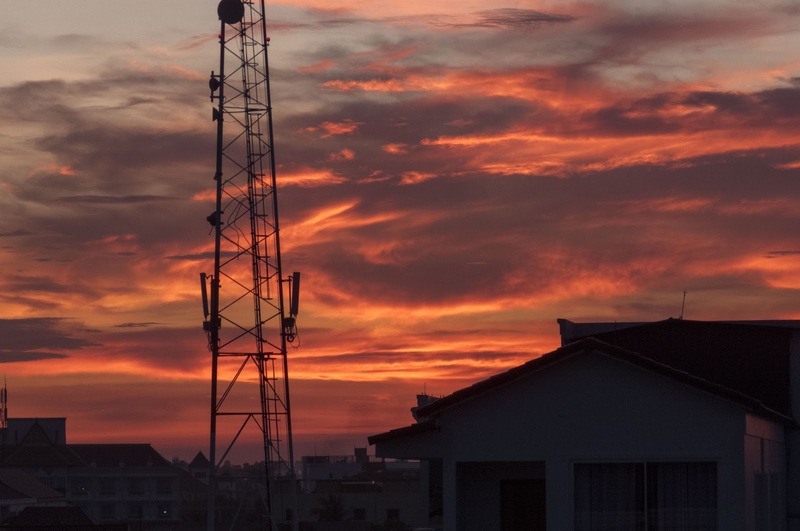 The pinks and oranges swirling in the clouds post-sunset were a sight to behold. Definitely take time to watch a sunset in Siem Reap preferably while sipping a cocktail. 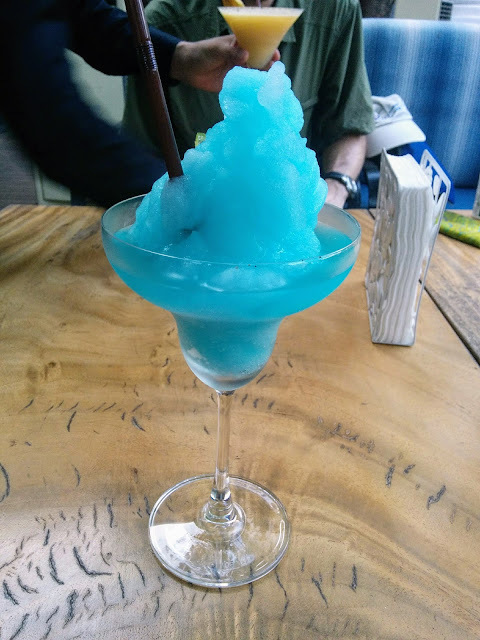 Speaking of cocktails, we found that another great way to beat the heat was to sip a frozen drink. Most hotel bars and the establishments on Pub Street serve cocktails for just a few dollars. I was wary of iced drinks at first but in our experience most places use 'clean' ice. In the end, my desire to beat the heat won out over my fear of getting sick from the ice. We didn't have any digestive problems as a result of sampling the cocktails. We tried a range of restaurants in Siem Reap and you generally find good value for money. We tended to go a bit more upmarket after I discovered a leggy grub in my rice at a cheap and cheerful restaurant at the roadside in town. The Old House just off of Pub Street had great atmosphere and tasty, spicy Cambodian food. We enjoyed it so much that we ate dinner there twice. Massages in Cambodia are quite affordable and in Siem Reap you can typically get a 60 minute Khmer Massage for $15 or less. 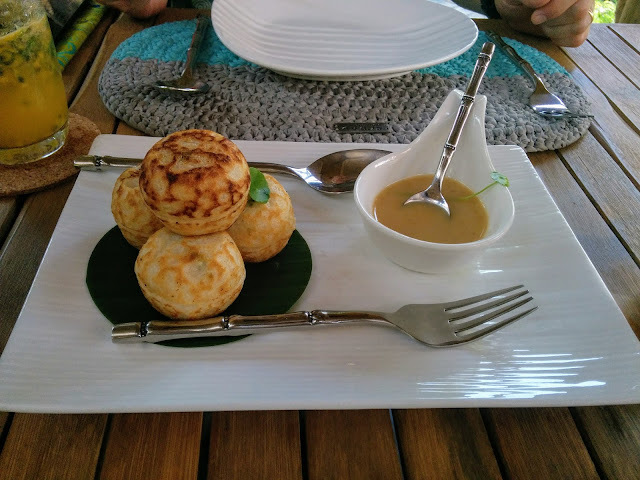 I tried the Lemongrass Garden on a recommendation from an expat living in Siem Reap. I ended up trying the Khmer twin touch massage where two masseuses work in tandem. It was fun to try once, but I don't feel like I got twice the value to justify twice the price. The Lemongrass Garden Spa itself was lovely, clean, and comfortable. We spent our final morning in Siem Reap in air-conditioned comfort at the Angkor National Museum. The museum is fanatical about not allowing photos inside and makes you check all your bags before entering. The building itself consists of open air courtyards but the exhibits themselves are air-conditioned. The Hall of 1000 Buddhas was definitely the highlight. We also saw a ton of artifacts from the temples at Angkor. We used the opportunity to reinforce what we'd learn from Pal, our guide to the temples, and recount the different forms of various gods and their preferred mounts as we encountered them at the museum (e.g., Garuda is the mount of Lord Vishnu and Shiva rides a bull). 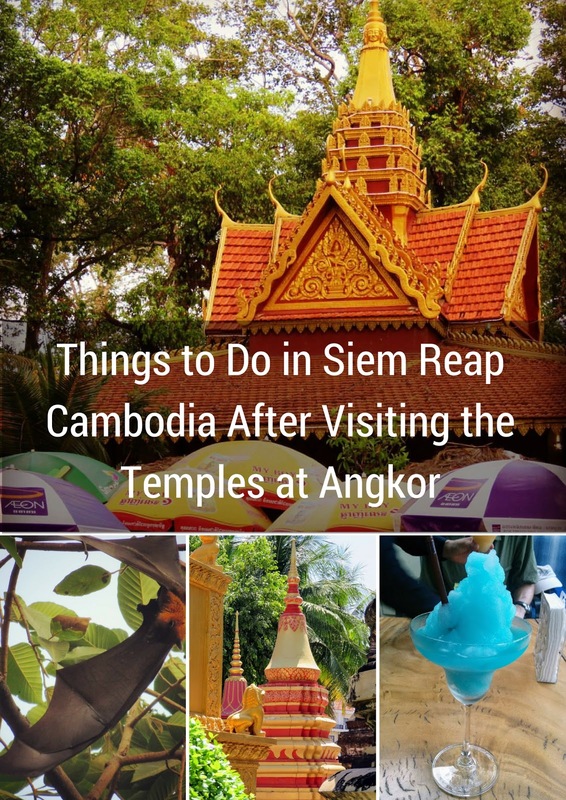 As you can see, there are a variety of things to do in Siem Reap after exploring the temples at Angkor. 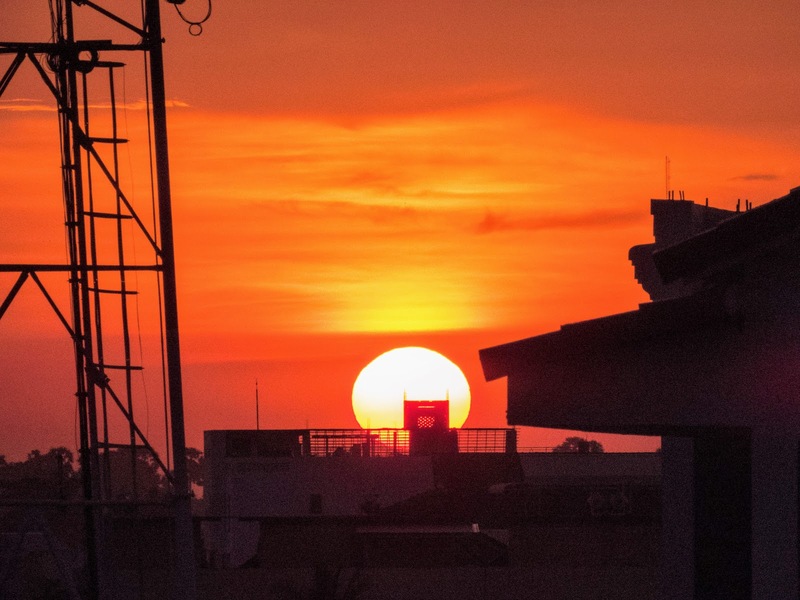 Why not expand your horizons a bit on your Cambodian vacation and take time to appreciate a city that is more than just the gateway to ancient Khmer civilizations? Have you spent time in Siem Reap, Cambodia? What were your favorite things to do? 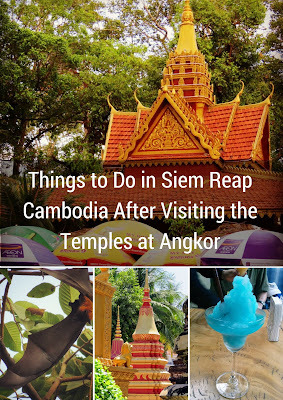 Learn about things to do in Siem Reap City besides the temples at Angkor. Explore Siem Reap Cambodia points of interest.